Writing this article is for me is a step into the past – some of which are very personal and painful memories. However, you will see the reason as the article progresses, and the critically important information I have included for the Jewish community. You will understand why I feel it is crucial to address. Let me begin with a young 16-year old teenager, who just months before experienced a family trauma with the passing of a two-year-old sister on the second day of Rosh Hashana – just days after her second birthday – from Tay-Sachs disease. Although we were prepared by the doctors for her death, the family was devastated by her loss. Fast forward to January just a few short months later, and we find out our beloved 39-year old mother has been diagnosed with breast cancer. We hadn’t even recovered from our sister’s passing and the emotions and grief that had permeated throughout our family, and now we were faced with another shadow on our doorstep. Our mother was a stalwart of strength even when faced with the heavy medical news. Instead, with her faith in Hashem, she agreed, as indicated by her physician at that time, to a one-sided radical mastectomy. This was an urgent decision to go through an operation of this magnitude and it landed right on my younger brother’s birthday. At that time, there were no other options, except this radical procedure, for any chance of survival. Surgery tears apart an organ of the body, but it does nothing to help the emotional scars that are left by such an operation. I watched my mother fight back the tremendous pain and the daily exercises of “walking the wall” with her arm for months to regain her full range of motion. And she did it every day, multiple times of the day, because she had a loving family that needed her to be healthy. We all pulled together, and she lived. Not only did she live past the 5-year survival rate, but she lived until she was 86 years old passing away from complications of Alzheimer’s not breast cancer. What I learned from this incredible woman was that with strong faith and Hashem’s blessing, a positive attitude, good sound medical care and surrounded by those who love you, one can beat the odds and live a good life. So, that now brings me to a very crucial and life-saving important discussion and the reason for this article about a pilot BRCA genetic testing study now being offered – especially for those of Ashkenazi Jewish origin – to the Jewish communities in New York, Boston, Philadelphia and Los Angeles. Please read this article carefully and be proactive to join in on this study. It could save your life or the life of someone you love. I want to thank Dr. Beth Karlan and the team working under her direction for bringing this to the public’s attention. According to research, Jews of Ashkenazi descent are 10 times more likely to carry mutations in the BRCA1 and BRCA2 genes than the general population. This leadsto an increased risk of breast, ovarian and other cancers in women. Mutations in the BRCA genes can affect men as well resulting in an increased risk for and male breast and prostate cancers. Dr. Beth Karlan, is a gynecologic oncologist at Cedars-Sinai Medical Center and Director of the Cedars-Sinai Women’s Cancer Program at the Samuel Oschin Comprehensive Cancer Institute. As Karlan progressed in her career, she would see clustering of sisters whose moms had died of breast or ovarian cancer and she was determined to help find the culprit for the diagnoses in these families riddled with cancer The BRCA1 gene was not discovered until 1994, with the BRCA2 gene being discovered a year later. The 3 specific mutations in BRCA1 and BRCA2 genes that are seen repeatedly in the Ashkenazi Jewish population are called “founder mutations” and are a result of populations that stay relatively insular. Any genetic mutation will be amplified within that population. Founder mutations and BRCA mutations do not only occur in Ashkenazi Jews, but also in other communities and populations around the world. Dr. Karlan launched the BRCA Founder OutReach Study (BFOR), offering BRCA genetic testing at NO COST to 4,000 eligible men and women of Ashkenazi (Easter European) Jewish ancestry. This testing is available through a simple blood draw. It’s estimated that 90% of the carriers don’t know they are carriers until someone in their family gets cancer. For every identified carrier, 50% of their blood relative will also be carriers. The genetic testing offered through this study is not to be confused with the widely available carrier screening, which tests for diseases such as Tay-Sachs, Gaucher’s disease, along with others, that have the potential to affect a future child. Participation includes accessing educational videos, signing a consent form, and providing information about personal and/or family history, all done online. Participants must be 25 years of age or older and have at least one grandparent of Ashkenazi Jewish ancestry. If people are eligible and choose to go ahead with the free testing, the blood draw will be done at a Quest Diagnostics lab and they choose to receive their results from their medical provider or from one of the genetic counselors involved in the study in their home city. What is a BRCA mutation? BRCA is a gene found in all humans. It is part of our DNA. BRCA genes help cells grow and repair errors in the DNA. Mutations in BRCA genes are spelling errors in the genetic code. They can cause the gene to not function properly. This can increase the risk for breast, ovarian, prostate, and possibly other cancers. The breast cancer lifetime risk is 10-12% for women without a BRCA mutation. It is as high as 80% for women with a BRCA mutation. The lifetime risk of ovarian cancer is 1.5% for women without a BRCA mutation. It is as high as 40% for women with a BRCA mutation. Men who carry BRCA gene mutations also have increased cancer risks, including for prostate cancer and male breast cancer. Until now, BRCA genetic testing has largely been limited to those with a family history of breast, ovarian, or prostate cancers. This testing does not capture up to 55% of individuals with certain BRCA mutations. An estimated 90 %of BRCA carriers do not know that they are BRCA-positive. A positive or negative BRCA test does not provide 100%certainty as to whether someone will develop cancer. However, testing provides those who are BRCA-positive with the knowledge to take steps that can significantly reduce their cancer risks. These steps may include earlier and more frequent cancer screening, cancer risk-reducing surgery, and risk-reducing medication. Experts believe that approximately 40% of all ovarian cancer in women of Ashkenazi Jewish ancestry may be prevented by BRCA testing and risk-reducing surgery. A single BRCA test can help spread knowledge about heightened cancer risk across an entire family. If you have a BRCA mutation, this means you inherited it from either your mother or father. As a result, there is a 50% chance that each of your siblings or children will also have the mutation. Both women and men age 25 or older, with at least one grandparent of Ashkenazi (Eastern European) Jewish origin are eligible to participate in the study. The pilot phase of the BFOR study launched in March 2018 in New York, Boston, Philadelphia, and Los Angeles metropolitan areas. In the future, BFOR may expand to other communities in the United States. How is BFOR addressing an unmet need? The BFOR study is pioneering a new effort to integrate genetic testing into medical care. This model uses an online platform. It brings together the convenience of direct-to-consumer genetic tests and the advantages of receiving health-related testing with the guidance of a medical care provider. BFOR provides access to personalized medical care by partnering with study participant’s primary care providers. It will also offer access to consultations with leading experts in cancer research, genetics, and treatment. 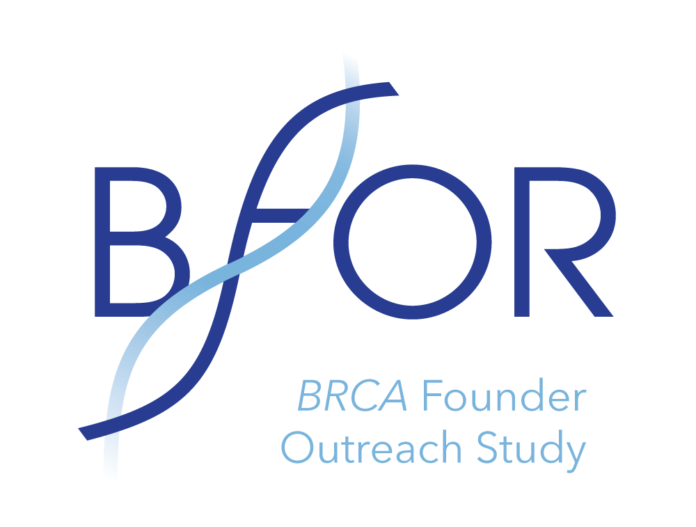 BFOR seeks to make life-saving knowledge of BRCA mutations more accessible to a greater number of people. BRCA genetic testing has been available for more than 20 years. Yet, most people at high-risk for carrying a BRCA mutation have not been screened. Until now, for the most part, testing has been limited to those with a personal or family history of cancers associated with BRCA. However, family history identifies only about half of the people who have one of the BRCA mutations. It has been estimated that 90% of BRCA carriers do not know that they are BRCA-positive. Why will this study focus on individuals of Ashkenazi Jewish ancestry? The BFOR study comes at the beginning of a new era in medicine. In this new era, genetic testing will be used to improve and personalize medical care for us all. Leading researchers believe that genetic testing of individuals with Ashkenazi (Eastern European) Jewish ancestry for certain kinds of BRCA mutations can demonstrate and refine this new model for genetic testing. The lessons learned from BFOR can be used more broadly to prevent and treat many types of cancer and other diseases. There are several key reasons that this population has been selected for the BFOR study. Those of Ashkenazi Jewish ancestry carry certain BRCA mutations at a frequency at least ten times higher than the rest of the population. Yet, only about five% of this population has been tested. BRCA genetic tests are cost-effective. They can also provide a conclusive yes or no result in individuals of Ashkenazi ancestry. Testing can lead to life-saving medical care. What if I am of Sephardic Jewish Ancestry? If your ancestors are Sephardic Jewish and you have no ancestors of Ashkenazi (Eastern European) ancestry, then the genetic testing in this study will not be sufficient for you. We recommend you speak with your health care provider about referral to a genetic counselor instead. You may also call the study for more information at 1-833-600-BFOR. How do I participate in the study? Click here to view the five simple steps required to participate in the study. How much does it cost to participate in the study? BFOR facilitates BRCA genetic testing at no cost to participants. What privacy safeguards will protect my personal information? Your medical information is protected by a federal law called HIPAA. The technology being used in this study is HIPAA compliant and safeguards are in place to protect personal information. If you join the BFOR study, it will limit access to personal information about you. Your name and how to contact you will be known only by study staff. This will include your primary care provider. Staff working on the study include genetic counselors and administrative staff who help get test results to you. It also includes those who maintain the study data base and online platform. Only those involved in the study will have access to your protected information. Will BFOR testing examine all of my genes? No. BFOR testing will only examine three specific locations on the BRCA genes. These are known as the BRCA Ashkenazi founder mutations. Can I withdraw even after I consent to be a part of the study? Yes. Participants are free to withdraw from the study at any time. What if I live outside of the areas where BFOR is offering the study? For the first phase of the study, only those living in the New York, Boston, Philadelphia, and Los Angeles metropolitan areas are eligible to participate. In the future, BFOR may expand to other communities in the U.S.
BFOR is an independent research initiative. The lead investigators are experts in the fields of cancer research and genetics. BFOR team members have led many different efforts to identify genetic changes that cause cancer. They have also developed approaches to early detection, prevention, and treatment. BFOR is made possible by the generosity of individual philanthropists. Outside Community and Scientific Advisory Boards provide input and oversight of the project. Click here for a list of those on the BFOR Executive Committee, Scientific Advisory Board, and Community Advisory Board. Certified genetic counselors are trained to be sensitive to your background and to give you the information you need to make your own decisions regarding genetic testing. These decisions are based on your family history, and the genetics of breast and ovarian cancer. They are also based on benefits and risks of testing and what you can do given positive or negative results. There are other factors that may influence your decision-­making process. Counselors can also explain issues of confidentiality and insurance reimbursement for genetic counseling and testing. If you opt for testing, genetic counselors will also help you understand what results mean for you and your family members. There are genetic counselors working with the BFOR Study. If I decide to have genetic testing, what protections do I have against insurer or employer discrimination? Effective in 2009, Congress passed the Genetic Information Nondiscrimination Act (GINA) into law. This law provides protection against most types of discrimination in health insurance coverage. It also generally protects against employment discrimination based on genetic test results. GINA prohibits employers from firing, refusing to hire, or discriminating against employees. This includes compensation, terms, conditions, or privileges of employment. In most instances, employers cannot disclose your personal genetic information. GINA generally prohibits insurance issuers from basing eligibility or adjusting premiums based on your genetic information. GINA provides protection from most types of discrimination in employment and health insurance coverage. But the law does have limitations. GINA does not cover the use of genetic information for life insurance, disability, or long-term care insurance policies. Additionally, protections may be limited for members of the military and some small business employees. A genetic counselor can help answer any questions you have about how genetic testing may affect your insurance or employment status. Is BFOR connected to any commercial entities? The BFOR study is entirely a not-for-profit research project, is not being performed to support any for-profit entities, and has no financial interests with respect to any companies or specific products. What should I do if I encounter technical issues during registration? While the registration experience is supported by all browsers, some work better than others. At this point we suggest you use one of the following browsers: Chrome, Safari, or Firefox. You may experience technical issues, such as video freezing, on Internet Explorer or Microsoft Edge. If you have any other questions or are experiencing any other technical issues, please reach out to us at info@bforstudy.com or call 1-833-600-BFOR. Previous articleSears will close another 72 stores as sales plunge and losses grow.